Metzitzim (Sheraton) Beach became part of Israeli cultural heritage when it was featured in a film of the same name in the 1970s. 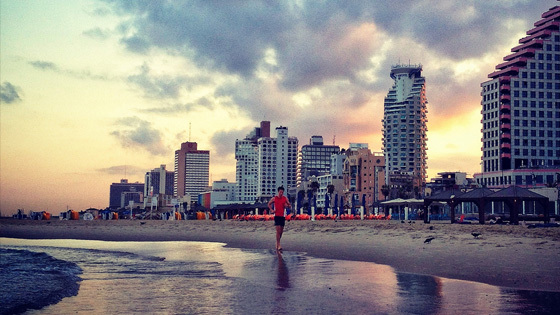 There is a beach bar which attracts a crowd of young, hip Israelis. Hilton Beach is popular with surfers, dog lovers and kayakers. It is also popular with the gay community and is “gay-friendly” especially the northern part beneath Atzmaut Park. Tzuk Beach and Tel Baruch Beach are in the extreme northern part of Tel Aviv and you would need a car or taxi to reach them. Tzuk Beach has great facilities and is the only Tel Aviv beach you have to pay to use (12ILS/8ILS). Tel Baruch Beach is a well maintained beach with plenty of parking and popular with families. Gordon Beach is located at the end of Gordon Street and Frishman Street and is close to the Gordon swimming pool and marina. The beach is popular with tourists because of its proximity to many hotels. Dolphinarium Beach is not one of the best beaches for swimming but on a Friday drummers, capoeira dancers and performers jam on the beach. It is also a popular beach for windsurfers. Bugroshov Beach and Jerusalem Beach are squeezed in here, best known for the seafood restaurant overlooking the beach and the year-round lifeguard service.